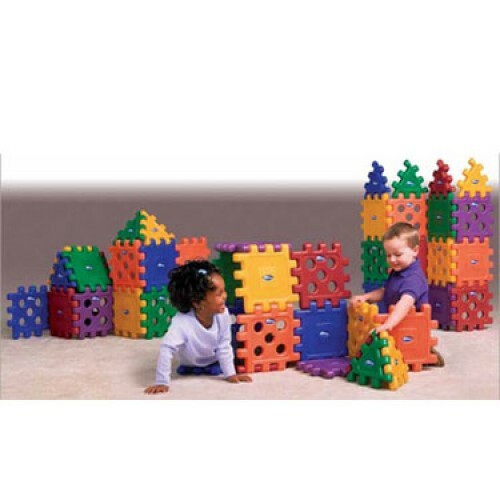 Our CarePlay Grid Blocks are heavy-duty blocks will create solid pathways for children to walk upon, tunnels for them to crawl through, or even a playroom to call their own. Because each block is exactly a square foot, they can be used for simple activities that introduce linear and area measurement. The 12-inch square blocks are just right for childrenâ€™s hands while the 3-by-3 design makes attaching the blocks easy. CarePlay Grid Blocks come in six bright primary and secondary colors that will continually look new because the colors are molded right in. Each set includes square blocks, both solid and see-through, as well as triangular blocks for pathway corners and pointed rooftops. At CarePlay we are:- Focused on Children All of our products are thoughtfully designed to function well, provide sensory stimulation, promote gross motor development, and perhaps most importantly, engage a childâ€™s imagination and creativity so the child is the creator and not the spectator. Commercial Quality - We develop products for commercial use. They are designed and engineered to withstand the exceptional demands of multi-child, multi-age, everyday play. Thatâ€™s why we stand behind our products with the CarePlay 10-Year Warranty. Experienced - Our team has a wealth of experience in creating quality products for young children. All of our products have been thoroughly reviewed with an advisory board of early childhood professionals, who manage, maintain and teach at early childhood facilities on a daily basis. Free Shipping - Usually ships in 3 to 4 business days.